Activision might have another billion dollar franchise on its hands soon. Compared to making $1 billion in 16 days, reaching a $500 million sales figure over the course of a year may not sound like much. However, unlike Activision's blockbuster Call of Duty series, Skylanders - which has now exceeded half a billion dollars in sales - is aimed primarily at children. In addition to selling faster than any other kids' gaming property in history, Skylanders, which uses physical toys in conjunction with its digital adventure, also topped action figure sales charts and outsold contemporaneous children's movies. Not bad, considering that its mascot was essentially in hibernation only a year or so ago. "Just a year ago, the concept of bringing toys to life in a virtual world was an untested play pattern ... Now the category has been established in the market and embraced by parents and kids everywhere," says Joshua Taub, a vice president at Activision. Taub isn't wrong about Skylanders gaining a foothold in the market: The $500 million figure includes both videogame and toy sales. $195 million of the total comes from Skylanders: Giants alone, which has only been out for two months. "It's gratifying to see kids excited about the adventures that await them both in the digital and physical worlds." 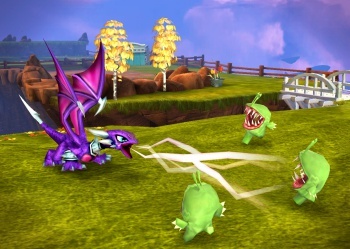 According to data from the NPD group, Skylanders was the fastest gaming IP for kids to reach the $500 million milestone. Perhaps even more noteworthy, however, is the fact that in 2012, Skylanders outsold traditional bestselling action figure lines, including Star Wars. When Skylanders: Giants appeared in stores, it beat out both Wreck-It Ralph and Rise of the Guardians - two top kids' movies - in sales that weekend. For a series that has marketed itself almost exclusively to a younger demographic, Skylanders has done pretty well. Perhaps the most heartening part of this story is that while the connectivity of toys is undoubtedly a clever sales gimmick, it seems to be a worthwhile game mechanic as well. The games themselves have garnered good reviews, suggesting that its sales record is well-earned. Skylanders may not surpass Call of Duty in popularity anytime soon, but Call of Duty doesn't have an anthropomorphic whale swinging an anchor, so we'll call it even for now.